Such an obvious idea not surprised this already exists but done very well and with full google support looks like rather than a hack. Now it remains to be seen whether these guys will let me somehow manipulate/interact with images. 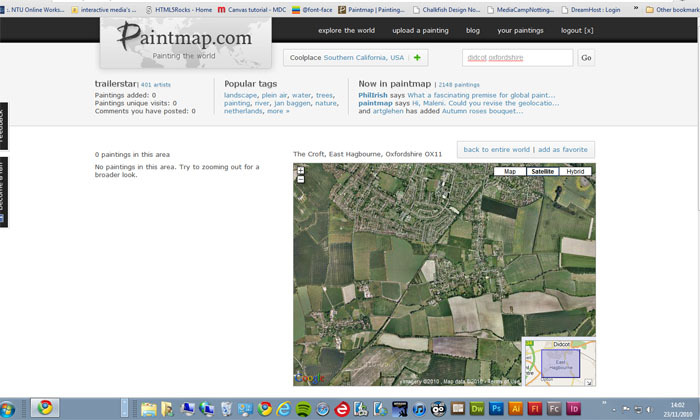 The screenshot below shows no activity in the area of railway track I chosen so it remains a blank canvas so to speak. maybe I can configure my own APP to both work with and display separately from the paintmap one. I have also contacted Google with idea – leaning more to a ‘contained’ and ‘curated’ version which is what I will have to do now the worldwide one exists. Seen quite a few steet art ‘curated’ versions as obviously straight photography of graffitti can be located direct on google maps/earth.